Nikhil Banerjee (Bangla: ????-?? ??????????) (14 October 1931?27 January 1986) was one of India's most prominent sitar players of the second half of the 20th Century. He never achieved the glamour of Vilayat Khan or his gurubhai Ravi Shankar, but Nikhil Banerjee did win great critical acclaim and the hearts of many music lovers. He is remembered as a musician's musician. Along with Ravi Shankar, Vasant Rai, and Ali Akbar Khan, he was trained by "Baba" Ustad Allauddin Khan of the Maihar gharana (school). Along with Ravi Shankar, Vasant Rai, and Ali Akbar Khan, he was trained by "Baba" Ustad Allauddin Khan of the Maihar gharana (school). Nikhil Banerjee was born in Calcutta into a Brahmin family, where music as a profession was discouraged, although his father, Jitendranath Banerjee, an amateur sitariya, taught him to play the instrument. Young Nikhil grew into a child prodigy, won an All-Bengal Sitar Competition at the age of 9 and soon was playing for All India Radio. At the time, his sister was a student of khyal great Amir Khan, who became a life-long influence. Jitendranath approached Mushtaq Ali Khan to take the boy as a disciple, but was turned down; instead Birendra Kishore Roy Chowdhury, the zamindar of Gouripur in present-day Bangladesh, was responsible for much of Nikhil's early training. In 1947 Banerjee met Allauddin Khan, who was to become his main guru. Allauddin played the sarod; Banerjee went to his concerts and followed him around, and in the end even went so far as to threaten to kill himself if he was not accepted as a disciple. Allauddin did not want to take on more students, but changed his mind after listening to one of Banerjee's radio broadcasts. The discipline under Allauddin Khan was legendary. For years, Nikhil's practice would start at four in the morning, and with few breaks continue to eleven o'clock ? at night ? a schedule which was naturally hard on his fingers. Among others, Allauddin also taught his son, Ali Akbar Khan, on the sarod; Ravi Shankar on the sitar; his daugther, Annapurna Devi on the surbahar, and Pannalal Ghosh on the flute. Obviously, what Allauddin was passing on to most of his students was not playing technique but the musical knowledge and approach of the Maihar gharana (school); yet there was a definite trend in his teaching to infuse the sitar and sarod with the been-baj aesthetic of the Rudra veena, surbahar and sursringar ? long, elaborate alap (unaccompanied improvisation) built on intricate meend work (bending of the note). 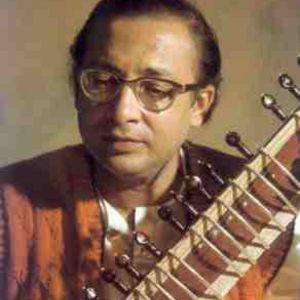 Under his teaching, Shankar and Banerjee developed different sitar styles , but to the uninitiated, Banerjee will sound like Ravi Shankar, similar but with a less buzzing sound. They played similar sitars, both with bass strings. After some five years in Maihar, Banerjee embarked on a concert career that was to take him to all corners of the world and last right up to his death. All through his life he kept taking lessons from Allauddin and his children, Ali Akbar and Annapurna Devi. Perhaps reflecting his early upbringing, he always remained a humble musician, and was content with much less limelight than a player of his stature could have vied for. For him, music-making was a spiritual rather than a worldly path. Even so, in 1968, he was decorated with the Padma Shri and posthumously received also the Padma Bhushan; at the time of his death by heart attack, he was a professor at the Ali Akbar Khan College of Music in Calcutta, but had not yet significantly taught any disciples of his own. Although he recorded extensively, the studio environment made Banerjee nervous. Not so the concert hall; his live albums, many of which were brought out around the turn of the 21st Century by Raga Records in New York, are widely considered to be the finest documents of his playing. Today, he is regarded as one of the greatest traditional sitarists of the 20th century. His interpretation of ragas was always highly traditional; at his very best, it was of the kind that would bring out wholly new ideas from a raga, ideas packing enormous surprise in that they were so clearly linked to tradition, yet so previously unthought of. He created a raga Manomanjari of his own, mixing ideas from Kalavati and Marwa. Throughout his career, Nikhil Banerjee played a Hiren Roy sitar.